Today is the first day of December! That means Christmas and all the other December holidays are getting much closer! I am so excited........and extremely busy! It's the good kind of busy though; lots of holiday traditions and spending time with family. Anyway, to celebrate, the Community Managers have given me some codes to give away! How awesome is that?!?! Since I am busy this month, and I bet a lot of you guys are too, I decided to make this easy and have a raffle. A few quick clicks and you will be entered for a chance to win amazing prizes! The winners will be announced during the day on Wednesday, December 23rd. Good luck to everyone and have an amazing holiday season! My favorite thing about Christmas in Pirate101 is the holiday decorating items available to decorate my ho8use and ship cabin. My favorite thing about Christmas is the look on people's faces when they get surprised by a gift that they weren't ever even expecting to get. My favorite thing about Christmas in pirate is that I get to decorate my ship cabin with the awesome crown shop Christmas decorations! My favorite part of christmas in Pirate101 is all of the holiday companions and items! My most favorite thing about Christmas in Pirate101 would have to be all the cool stuff that comes into the crowns shop. My favorite thing in the crown shop would have to be the reindeer. Happy Holidays! What I like about Christmas in Pirate101 is the holiday companions. 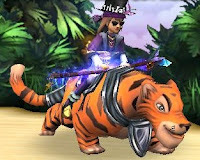 I enjoy all of the unique Christmas Pets in Pirate101! My favorite thing about Christmas: Pirate wise, would be the 12 days of the spiral and all the decorations !!! Favorite part is the 12 days of christmas in the spiral and the charity mounts! My favorite thing about Christmas in Pirate101 is the 12 days of the spiral & the holiday companions and crown shop items. My favorite thing in Christmas in Pirate101 is the yuletide spirit that persists in everyone's heart!!! My favorite thing is the 12 days! My favorite thing in Pirate 101 at Christmas is the 12 days of the spiral and the holiday items. My favorite thing about Christmas in Pirate101 is the gift boxes and the new pets and decorations that came with them.